Rechargeable silica gel dehumidifiers absorb moisture in enclosed areas preventing condensation and stopping rust, mildew, corrosion, and spoilage. The 200 Gram Silica Gel Unit protects up to 15 cubic feet of enclosed space and is ideal for small safes, display cabinets, storage containers, and more. Each unit has a built-in moisture indicator that changes from brown (dry) to pale green (humid)to signal it has reached its maximum moisture saturation level. Once that level has been reached, the unit can easily be recharged in any conventional oven (3 hours at 235 degrees F). The units can be recharged as often as needed for lifetime protection. Silica gel is inert and non-toxic. Will not emit harmful vapors, stain, or cause chemical reaction. Safe to use with sensitive materials. Measures 3-1/2" x 2" x 4-1/2". The units are extremely effective at protecting your valuables such as family photos, documents, guns, electronics, jewelry, food, leather, coin and stamp collections, tools, collectibles, and much more. 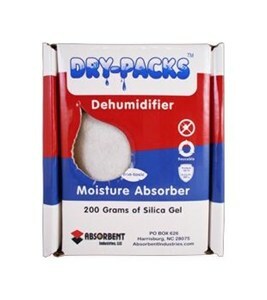 Please Note: When you first use a Silica Gel Dehumidifier in a particular area, it may become saturated rather quickly as it absorbs residual moisture. Once the residual dampness is removed, you can maintain a dry condition with less frequent need to reactivate. Silica Gel Dehumidifier Comparison Chart and FAQs. Click here to view all sizes of the Rechargeable Silica Gel Dehumidifiers. Get answers to frequently asked questions about Silica Gel. Q. Can I reuse silica gel? A. All of our "Rechargeable" Silica gel, including this 200 gram box, can be reused after recharging. We also sell "One Time Use" Silica gel packs that cannot be reused. The packaging type dictates whether drying is practical or not. Q. How do I recharge the silica gel? A. It's easy to reactivate (dry) the silica gel unit so it can be reused over and over again. Simply remove the bag of silica gel from the box and place in the oven on a oven safe baking sheet at 235 degrees F for 3 hours. Q. How many times can I reuse the rechargeable silica gel packages? A. Indefinitely, silica gel does not go "bad" and can be used for a lifetime. Q. How can I tell if it needs to be recharged? A. The humidity indicator card on the bottom of the box will change from dark brown to pale green. Q. Is Silica Gel safe to use around foods? A. Yes, it is inert, non-toxic and safe to use to protect foods, medicines, and a wide variety of sensitive materials. Q. Can I obtain a Certificate of Analysis with my Sorb-It Silca Gel order? A. Yes, simply let our Customer Service Department know that you require one.